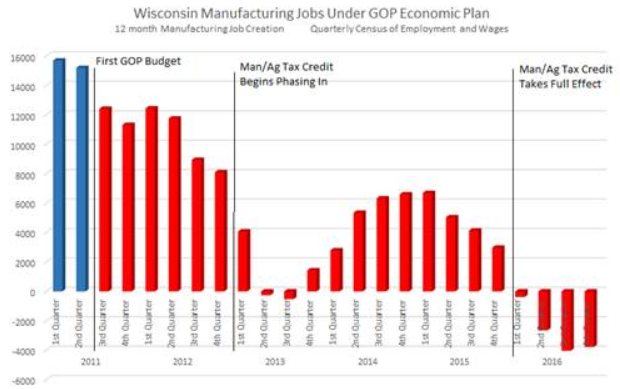 DemoCurmudgeon: Walker still waiting for Manufacturing Renaissance, which ain't happening! Walker still waiting for Manufacturing Renaissance, which ain't happening! 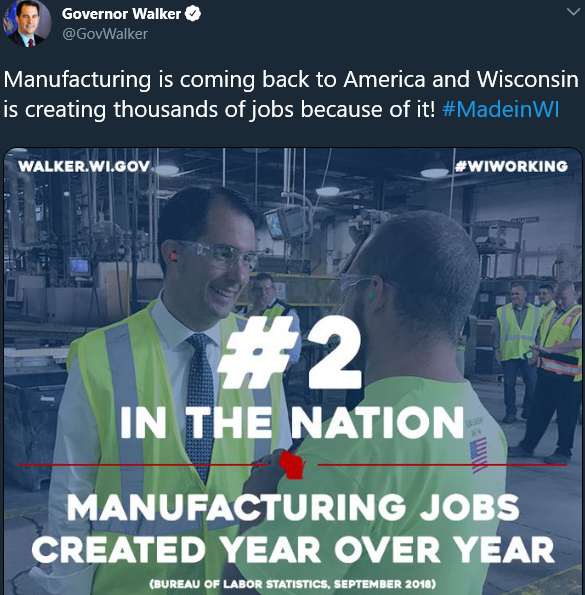 I once wrote back in August of 2015: "Walker is stuck in the past, working on a manufacturing renaissance in Wisconsin. In fact, Walker is attacking, vilifying, and stopping emerging industries he feels aren't part of the Republican Party platform, like wind, solar and mass transit." In March of 2017, WPR reported that Wisconsin lost "4,000 Jobs in 12-Month Period Ending In September 2016. 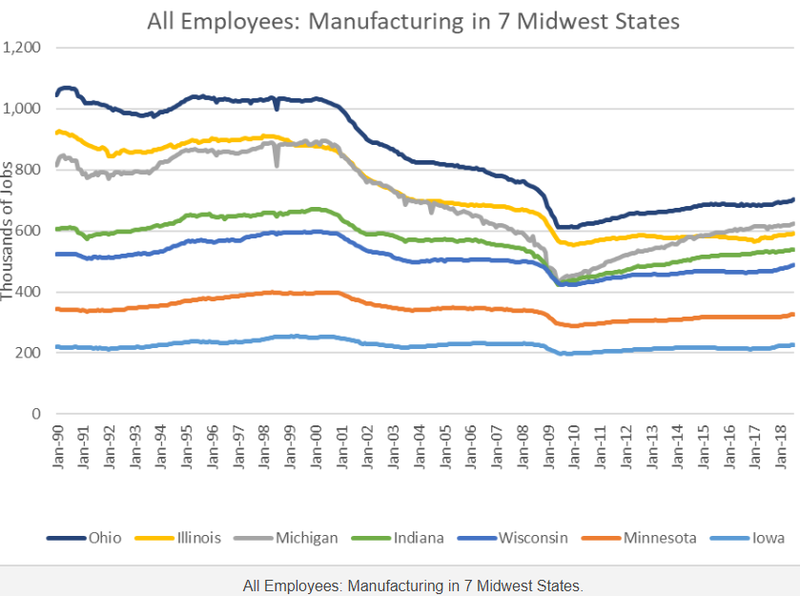 A total of 27 states lost manufacturing jobs over the same span, and so did the national economy:"
University Michigan Labor Economist Don Grimes: "No political leader if they had looked at the data and understand what's going on, should ever bet their future on manufacturing job growth. Because it's not going to happen." Gov. Scott Walker said fewer manufacturing jobs might not be such a bad thing for Wisconsin, as long as wages are increasing. "It's not just how many jobs — it's are those jobs paying at a significant level. If we see wages go up in manufacturing, to me, that's my ultimate goal. Overall, it’s just a different type of manufacturing – you’re going to see more and more automation. You can have successful manufacturing companies that don’t necessarily match all those (previous) numbers." Urban Milwaukee: The Manufacturing and Agriculture Tax Credit reflects the danger of letting nostalgia for the past drive economic policy, of succumbing to the hope that we can return to when manufacturing drove the Wisconsin economy. While it is important not to write off manufacturing, it is also a mistake to expect a return to the days of well-paid, but low-skilled and highly repetitious mass manufacturing jobs. Those jobs are either being automated away or migrating to nations with much lower labor costs. In its fixation on manufacturing jobs, Wisconsin runs the danger of neglecting the investments needed to build a new economy. It blocks serious planning for what comes next. Ending the manufacturing tax credit would free up roughly $300 million that could be directed to more productive uses. Cohen: "We create jobs through services...the big increase is we saw more need for workers in business services...not manufacturing. In fact, we saw more voluntary leavers from the manufacturing industry, because as the job market tightens, people will volentarily leave the manufacturing industry and go into the service industry." Today service employment has grown to around 130 million, while goods producers have been stuck at 20 million for the past 80 years. MSN: Over the past 50 years, American jobs have steadily moved away from factories, mimicking the shift from farm to factory in the 50 years before that. The cause of each phenomenon was largely the same: technology, automation and the associated productivity growth meant we needed fewer workers to produce even more goods. The causal factor in the decline of many Midwest places was simply dogged, stubborn, almost prideful ignorance about century-long changes to the world economy ... it has mistakenly convinced millions of Midwesterners that factory jobs may once again be plentiful. They won’t; even as manufacturing production will continue to expand, employment will not. Peak manufacturing employment in the Midwest is nearly five decades behind us, when Chinese and Mexican exports were trivial. Yet far too many communities continued to pursue “jobs attraction” policies that failed them since the 1960s. Nationally, manufacturing employment growth has slowed since April, and here in Indiana, it dipped into negative territory for two consecutive months. The manufacturing portions of the Fed’s Midwest economic index have been negative for four months. To be clear, the worst is yet to come as both tariffs and their lagging effects will plague us well into 2019. And, in an underappreciated farewell speech, President Obama made it quite plain “. . . the next wave of economic dislocation won’t come from overseas. It will come from the relentless pace of automation that makes many good, middle-class jobs obsolete.” Like him or not, that statement is as true and obvious as the rising sun. Ignoring almost the whole of those truths, today we pursue a trade war. It is ironic that the very places that ignored the economic changes of the past half-century will be the first to feel the spreading pain of this bad medicine.